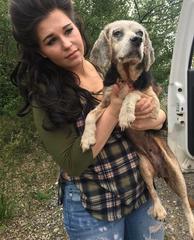 About Us – A Reason to Believe Animal Rescue, Inc.
Jessica rescuing an old, sick beagle abandoned on a coal road, unable to walk. The blue star marks our location in WV. Blog post: I used to pray for what I have now. A Reason To Believe Animal Rescue, Inc. (ARTBAR) was founded by Jessica Hill White and Wes White. We live in a rural community in southwestern West Virginia where strays are abundant and animal control is limited. We obtained our 501(c)(3) non-profit status on January 19, 2017. The mission of A Reason To Believe Animal Rescue is to rescue homeless or neglected domestic animals (including but not necessarily limited to dogs), provide veterinary care, and get them placed them in great adoptive homes. All are spayed/neutered prior to adoption unless they cannot medically safely undergo anesthesia (i.e., severe heart condition). We house these animals in foster homes, kennels, or boarding as needed. We work in collaboration with shelters, veterinarians, rescues, owners needing to rehome their pets, and the public. We work to reduce the animal overpopulation issue by spaying and neutering as part of our process. We work to ensure the safety of the public by vaccinating according to the law and as the health of the animal permits based on the recommendations of our veterinarian. We treat for parasites, injuries, dentals, skin or ear infections. etc. No, we cannot afford to pay your vet bill, but if you choose to surrender your sick or injured pet to us, we will fundraise to get it the care it needs. 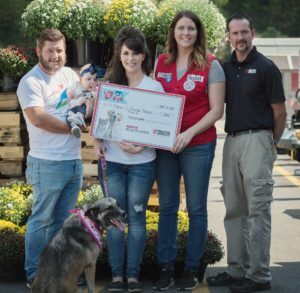 Wes, Ivy Lynn, and Jessica accept a $5,000 contest prize from Tractor Supply in 2017 while Raleigh (adoptable) watches.